As with any antique clothing style, Edwardian Titanic shoes are not part of modern footwear fashion. That makes dressing up in an Edwardian Titanic outfit challenging. Sure, you can buy vintage shoes, but their age makes them very delicate and best suited for show and tell only. As for reproduction shoes…. they are near impossible to find. One newer brand, however, has a few fabulous Edwardian reproduction shoes: this “Astoria” shoe made by American-Duchess is a strappy, short heel pump in either Ivory or black leather with smooth leather soles ideal for dancing. They are highly recommended (beware of the cheap knock-offs sold elsewhere). 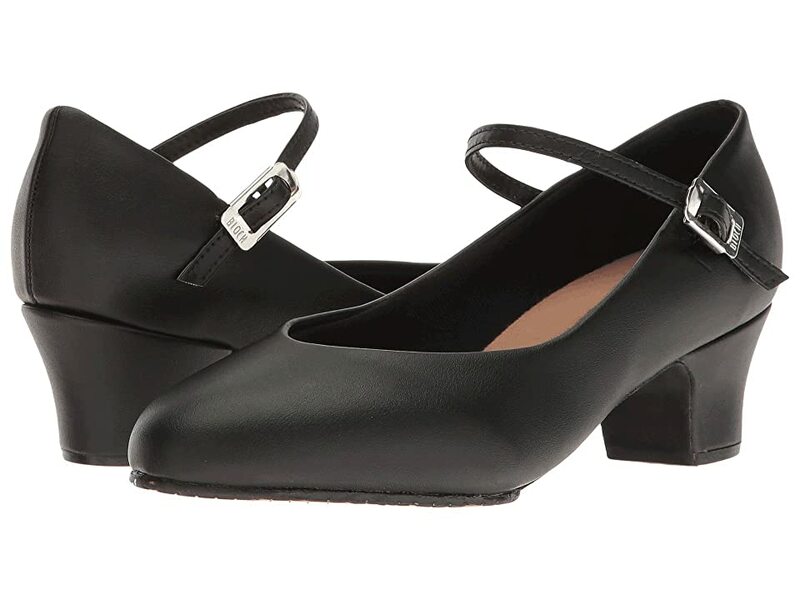 Outside of reproduction shoes, you can use new vintage inspired shoes that have enough of the Titanic era design to them to make them good costume choices. More on that in a moment. Most of the Victorian or Edwardian era women’s shoes were tall lace up boots. While these continued to be a popular choice for working daywear or traveling shoes, first class women wanted more beauty and comfort in their footwear. The time of the Titanic sinking was the height of shoe fashion. Boot style shoes were made of colored velvet and silk instead of leather, and laced-up with wide silky ribbon. Slip-ons in the form of mules came back in vogue and were embellished with beads, pearls and applique. An early version of the Mary Jane was introduced as a short heeled pump with 3 or more button straps across the foot’s vamp. The recent exhibits of Titanic artifacts show that many passengers wore these styles of shoes on board. Learn about vintage Edwardian era shoes here. 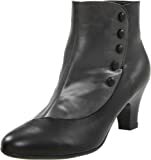 Edwardian boots were either lace-up or button-up with the buttons fastening on the outside like this boot. The boot could either be a solid color or two-toned like men’s spats. This nice color combination is good for daywear or while traveling to the Titanic. An excellent choice for an all around great boot. In the Titanic movie, Rose wore boots similar to these with her blue velvet ‘flying’ dress. The movie version boots were lace-up, and these had straps and buttons, which still makes them very period correct. They come in black or purple, and are made by Pleaser, which I don’t normally recommend, but these are an exception. These next two shoes are the closest pumps I could find that feature straps that were very common in Edwardian pumps and boots. Usually shoes had three or more straps either lying straight across or zigzag for more pizzazz. The straps often had beads to match the decoration on the shoe toe. Although these shoes only have two straps, they are the right style and heel height, which makes them a very good choice. Plus, I just love the affordable price and color choices. 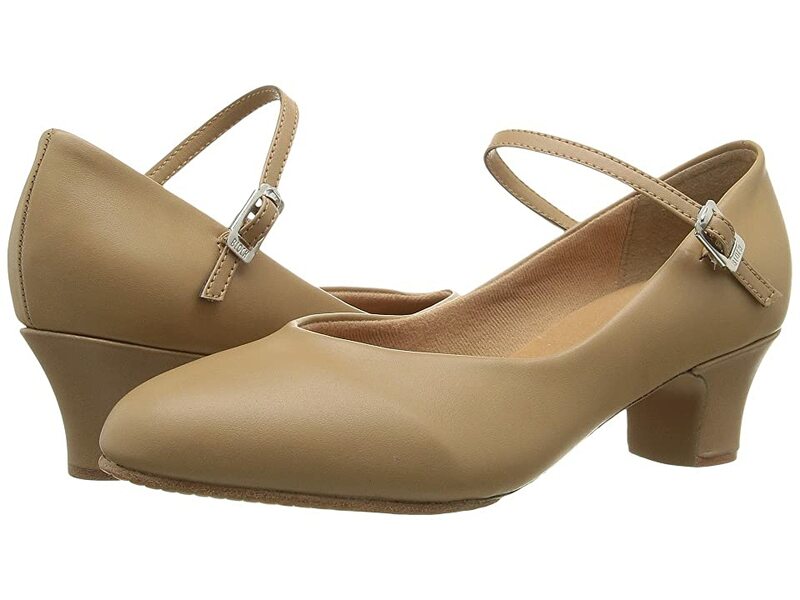 This foot friendly, cross strap shoe is another excellent alternative for an Edwardian Titanic shoe. It comes in many widths and additional colors. It is a design that would carry well into the early 1920s with the addition of the T-strap down the center. The picture of these in black don’t do justice to the design. The shape of the shoe is very “antique”, with the heel thin but otherwise perfectly carved into the standard boot heel shape on the Victorian-Edwardian era. I would suggest adding a rhinestone brooch or clip to the top for some extra sparkle. Available in black, blue and teal blue. With a few craft supplies and a pair of plain pumps or mules, you can make a pair of Titanic style shoes. 1. 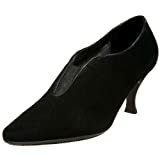 Locate a pair of plaid colored, low-heeled pumps or mules with a fabric finish like velvet, silk, satin or cotton. Suede or micro-suede can work well, too. Leather will be OK if you don’t have anything else, but avoid patent leather (shiny stuff). The color should match your dress. Use black or white, if that’s not possible. 2. Find some applique or thick lace trim at your local fabric or craft store. You can even use beaded trim instead of a solid applique. The trim should match your shoes. If it’s a white trim made of cotton or other natural fiber, you can also die it with fabric dye. Man-made material won’t die. You can, however, use fabric paint to change the color. TJ Formal carries a line of Coloriffics stick-on applique for shoes that would be perfect for this project. They also make rhinestone clips for decorating the tops of shoes. 3. Glue or sew on the applique to the top toe of the shoe in a triangle shape with the point pointing towards the tip. For mules, you can wrap the whole shoe in applique if you wish. www.bustledress.com This site has some good examples of beaded Titanic era shoes. www.pinterest.com has pictures of antique Edwardian shoes for more inspiration. 4. Add more beads, rhinestone or jewels for more sparkle. 5. That’s it. You’re done. It’s a very easy project and the results are amazing. Here are the shoes I made. I started with black Astoria Shoes from American-Duchess and added peel and stick on rhinestone stickers over the toe, heel and edges. The stickers I found were made by Recollections in the scrap booking section of Michael’s craft store. I love that these are just stickers so they are temporary. I can decorate these shoes over and over again to coordinate with my dress. So now you know about the various first class styles of Edwardian Titanic shoes and how to make a pair or buy new shoes with the correct style. For more history and examples of Edwardian Titanic shoes, visit ng.shoe-icons.com/museum. I’d love to know what Titanic shoe style you love best. Leave a comment below. I wish they would bring back the vintage boots and shoes cause a lot of girls would love ’em cause they watch the titanic a lot so why bring those vintage again. This was a very helpful website! Thanks so much. I’m looking for some shoes for my daughter who will be in Titanic the Musical this May. She wears a size 5 however, so it is difficult! Hi Debbie, your web site is a wealth of information for researching the fashions on the Titanic! We will be going o0n the Titanic memorial cruise in April 100 years to the day the titanic left Southampton. I want to wear some clothes similar to those worn by the women on that voyage. I look forward to looking through these recommended websites to get ideas. We live in Canberra Australia so any help in this area is great, cheers Glenda. Saw your post today elsewhere….had to visit. What an interesting site you have. I am so drawn to 30’s and Victorian era movies. Movies are a big inspiration for historical fashion. Its amazing how fashion can change how you think, act and feel different in every era. Thanks for visiting!